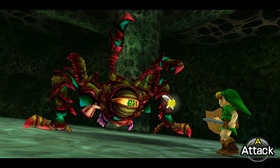 We have more news from the guys over at Zelda Dungeon, this time on the Boss Replay Challenge. In Ocarina of Time 3D Link can now talk to his bed in his treehouse. You have the option of sleeping to regain health (take that great fairies), or taking the Boss Replay Challege, where you can reface any bosses that you’re already defeated in the game. It also keeps track of how many times you’ve defeated the boss, and your quickest time. There is also the gauntlet mode, where you can face all of the bosses in succession without restored health. You can use whatever you have in your bottles however. The Master Quest version of the Boss Replay Challenge also has the bosses inflicting twice as much damage. I wonder whether we’ll be able to share our boss times online?